Friends and family toasted and roasted local businessman J.H. 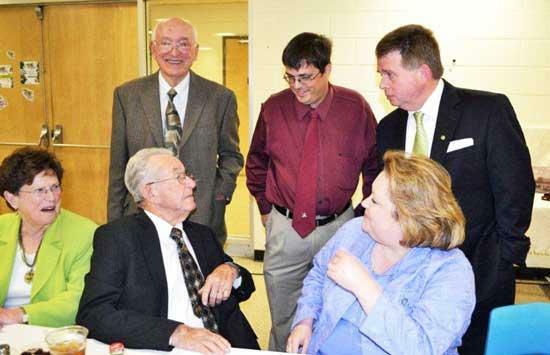 "Hal" Larimer during the fifth annual Friends of Adams Memorial Library Roast at Cannon County High School, April 21. Larimer, former owner of Woodbury Funeral Home, seemed to enjoy the comments - favorable or otherwise - as roasters John "Bubba" Woodfin, Kenny Gilley, Jean Hazen and Tracie Wolford made their way to the podium. Lois Larimer and Korie Aycock were granted three minutes each at the end. Larimer's roast brought in more than $33,000 toward the cost of building a major addition to the Adams Memorial Library, according to Charlie Harrell, president of the Friends of Adams Memorial Library. Previous roastees were Austin Jennings, Bill Smith, Nolan "Dude" Northcutt and Wilma Adams. Larimer, 91, was born in Erwin, Tennessee, March 7, 1920 and by the time he was 20, made the move to Woodbury, where he puchased a store in 1940 and called it Hal's Grocery. He eventually would purchase Woodbury Funeral Home and help build WBFJ (later changed to WBRY) Radio in 1963. Through all of his successful business ventures, Larimer also made lifelong friends and widely gained a reputation for doing right by them. It didn't keep the roasters from sharing some of the funnier stories they recall. Woodfin, owner of Woodfin's Funeral Home in Woodbury, took time to thank Lois Larimer as a driving force in Hal's life. "I want to thank you Lois for keeping Hal alive," Woodfin said. "I want to thank you for making him go to the doctor even when he did not want to, for taking his medicine, his heart pills, his blood pressure bills ... and his Viagra." Woodfin's remarks drew one of the loudest ovations and laughs of the evening. The longtime friend also talked of trips the two had made and the seedy hotels Larimer made them stay in and what those visits led to through the years. Gilley, Larimer's stepson and current owner of Woodbury Funeral Home, mainly talked about the good times he spent with Hal growing up, but did still find time to reveal a few funny stories. Gilley informed the more than 150 in attendance that he began working for Hal at the funeral home as a 13-year-old doing odd jobs. "He would let me drive the old station wagon around different places," Gilley said. "I would drive to Murfreesboro, Manchester and other places. Of course, I didn't have a license but Hal didn't seem to mind. Things were different back then." And Gilley told of the time when he got lost and several family members and neighbors were looking for him. Gilley says that his mother, Lois Larimer, called for help and feared her son may have had a heart attack or something. "I come walking back up the road and here are all of these people looking for me," Gilley said. "Hal shows up driving the hearse. He said it was to get me to the hospital fast if I needed to go. There is something unnerving about the undertaker showing up in a hearse to get you." Hunting trip? There were a few of those also. Larimer owned a farm in Woodbury and had sold it, Gilley told. The man who purchased the farm had taken residence even though the paperwork had yet to go through. Gilley said he had told Hal about a big deer he had spotted on the land and that he was going hunting. Larimer decided he wanted to join. "I usually parked my car at the road and walked in but Hal said he still owned the farm and that he wasn't walking that far, he would just drive in," Gilley said. "We pulled up in front of the house, sat in our car and loaded our shotguns and as we were about to get out a man comes out of the house and is standing on his front porch in his underwear with a gun pointed at them." That was quite an experience, too, Gilley said. Though his stories were humorous and enjoyable, Gilley's respect and admiration for Larimer showed most when he said, "Hal is the best friend, partner and dad a person could ever have." Hazen also spoke of the good man Larimer is and the joy he has brought into so many lives, but she also revealed a few funny stories. "Hal was always punctual, tactful and always wanted personalized service," Hazen said. "Once a customer was ordering a headstone and told Hal to write down the wording just as he said it. The gentleman wanted the first line to read, 'May You Rest In Peace,' and he wanted that on both sides. He told Hal if there was enough room he wanted to have the wording, 'I'll see you in heaven." When the headstone was delivered it read: "May you rest in peace ... and if there is enough room I'll see you in Heaven." There was also the time Hal took a part-time job as a taxi driver in Nashville. "Hal had picked up his first fare and he was driving the person way out of town when all of a sudden the person reached up and tapped Hal on the shoulder," Hazen said. This started Hal, causing him to come to a stop. "I normally drive a hearse and no one ever taps me on the shoulder," Hal told the fare. Wolford, Larimer's granddaughter, also gave up some goods on Hal. She told of a special trip they had taken to London. "One night we were asleep and in the middle of the night (Hal) was awake and heard an alarm," Wolford said. "He leaves me sleeping and runs down the steps to the lobby of this fine hotel and yells, 'Where is the fire?' The Brits behind the desk looked at this gentlemen from Tennessee in his canary yellow pajamas and didn't know what he was doing. He asked again, 'Where is the fire?' They informed him there was no fire. The sound he heard was a burglar alarm outside in a car." There was another night when Tracie was sleeping and Hal woke her in the middle of the night. "He told me he needed me to get up," Wolford said. "(Hal) is a big CNN watcher. I'm trying to get him fair and balanced but it is not working. He was watching TV and something bad had happened. We sat in front of the TV and it looked like a Presidential press conference and it was very serious. A nuclear bomb had exploded in the harbor in Charleston, S.C. It was a sobering moment. I asked, 'What should we do?' I called mom and told her to turn on the TV. She turned it on and there was a commercial, which was strange. She later called back to tell me it was a movie. It wasn't real." Wolford also talked about getting even with Hal for not buying tires from her husband's family business. "(Hal) had called me a while back and said (Lois) needed some new tires," Wolford said. "My husband runs a fairly large tire company so I told him I thought we could take of that. (Hal) called a couple days later and said not to worry about because he had bought four new Michelon tires for (Lois) at Bud's Tire and that she was alright. I'm like, 'Really, you went to Bud's Tire? Nothing against Bud's but that isn't the company name. "(Turning to Hal) That's alright Pops, don't worry about it because when you die I'm going to take you to Smith's (Funeral Home)." That line brought a roaring ovation from the crowd, which included Bill Smith. Aycock spoke of some of Hal's favorite quips but also added a touch of love and admiration for Hal. "You changed our lives," Korie told him. "I don't know where I would be today without your influence." Lois made an attempt at roasting her husband but after attempting to tell a story decided she had better back off for fear of Hal wanting to later get even. The roast was a major success and the honored guest took his prodding and poking in jest because at the end of the evening all friends of the Adams Memorial Library were the big winners. Mr. Hal has always shown his kindness and care for family to my family during the loss of loved ones. He was expecially kind and took extra time to talk with me when we lost my father. He is one of the finest men I have ever known and greatly appreciate his care and devotion to all of Cannon County. Both photos by Donna Nichols.